It’s been two years since Kobe Bryant played in the NBA. But he’s still the Los Angeles Lakers’ biggest draw. Bryant, an 18-time All-Star with five NBA Finals rings, will see BOTH of his numbers – Nos. 8 and 24 – retired on Dec. 18 when the Lakers host the hottest draw in the NBA, the defending NBA champion Golden State Warriors. If a Lakers ticket to see the Warriors at Staples Center wasn't going to be expensive enough, couple that with the retirement of Bryant’s jerseys and the cost to get into a single game will be more than $1,000. 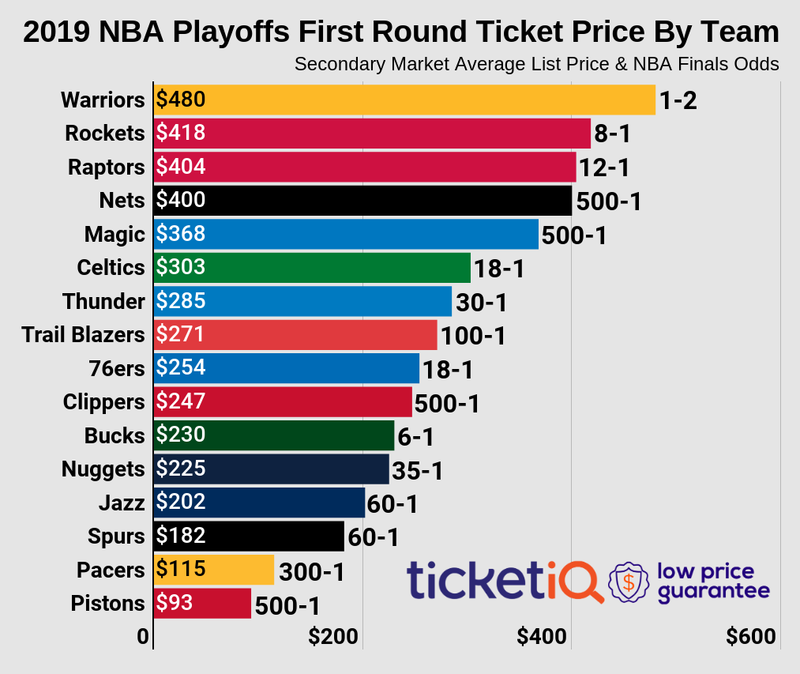 According to data tracked by TicketIQ.com, the current asking price for a ticket to that Dec. 18 game at Staples Center is $1,477. 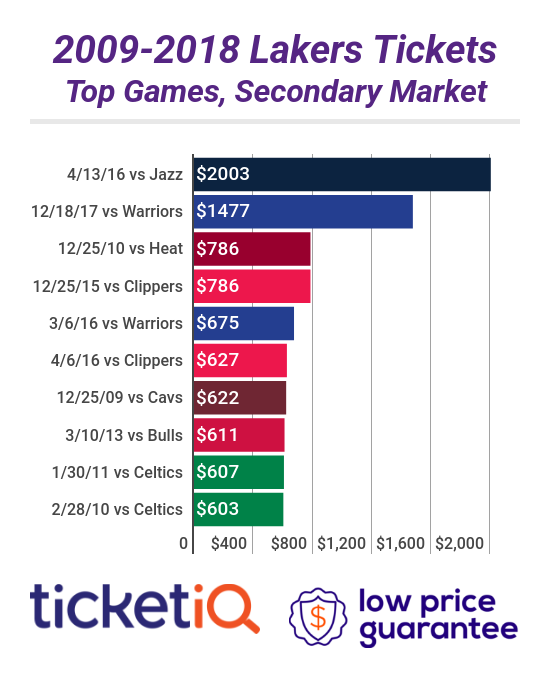 That price is the highest for a Lakers-Warriors game since TIcketIQ.com started tracking data in 2010. The next highest ticket was $675 for the March 6, 2016 matchup. To put the cost of this game into even more perspective, fans paid an average of $405 to see Shaquille O’Neal’s jersey retired in an April 2, 2013 game against Dallas. But three years later, a ticket to Bryant’s final game – in which he scored 60 points against the Utah Jazz – cost an average of $2,003. Just to get in the door, fans paid $633. To get into next week’s game will cost at least $395, and that will only get fans a seat where they’ll need binoculars to see the action. The retiring of two numbers for one player is unusual and begs the question – why did Kobe wear two numbers during his 20-year career with the Lakers? It’s a good question with multiple answers. Bryant may have initially wanted No. 33, but a guy named Kareem used to wear that and the Lakers had already retired it. So he took No. 8, because his alternate favorite number, 24, was being worn by George McCloud. Bryant switched to No. 24 in advance of the 2006-07 season. The retirement of Bryant’s numbers will make the game the most expensive in the NBA this season and is pricey enough to skew the average price of a ticket so far this season. If the Dec. 18 game is included, the average price for a Lakers home game is $316. If the game isn’t included, it’s $244. Whether you’ve got a pot of gold to spend or just a couple of nickels (OK, Ben Franklins) to rub together, TicketIQ.com can help you watch history. Among TicketIQ.com’s Low Price Guarantee listings Dec. 12, tickets in Section 306, at the tippy-top of the arena on a corner behind the basket, were available for $355 while seats in Row 20 of Section 110 across from both teams’ benches, were listed at $1,429.